The Unicoi County High School Lady Devil basketball team (4-1) kicked off the 2018 Triten Insurance Thanksgiving Tournament at Sullivan East with a 62-42 victory over the Hampton Lady Bulldogs on Monday, Nov 19. The Lady Devils were led by senior guard Chloe Powers, who went off for 23 points including 5 three-pointers. Powers was all over the court as she finished with 9 rebounds, 2 steals and 4 assists. Junior Ashton Vance scored 11 points, while senior guard Kaylee Hendrickson scored 7. Junior guard Kaylia Street scored 6 points and sophomore guard Tenley Holt scored 4. They were followed by senior post Allee Griffith, sophomore guard Leah Edney, and freshman guard Abigail Rush who all scored 3 points each. Sophomore guard Caroline Podvin scored 2 points. Griffith finished with 6 rebounds and 3 steals and Podvin finished with 2 rebounds, 4 steals and 4 assists. The Lady Devils continued to be solid at the free throw line, going 10-13 against Hampton for 76 percent. Coach Kerri King and her staff have the Lady Devils on a roll. “We communicated well on defense and offensively we had better movement with the ball,” King told The Erwin Record. King can already see growth in this new look Lady Devils team. “The girls took adjustments we made from the last game and applied them to tonight’s game,” King said. Tournament play continued for the UCHS Lady Devils as they took on the Dobyns Bennett Lady Indians on Wednesday, Nov. 21, at Sullivan East. Despite taking the lead early and leading at halftime, the Lady Devils fell to the Lady Indians 71-58. The loss was the first of the season for the Lady Devils. Powers led the Lady Devils with 14 points, followed by Hendrickson with 11 points. Vance followed with 10 points. Podvin had 8 points and Griffith had 7 points. Holt had 6 points and Street had 2. Unfortunately for the Lady Devils, they did not have an answer for tournament MVP Courtney Whitson, who finished with 33 points. Griffith finished with 3 of the teams total 12 assists and 8 rebounds. The Lady Devils continued to shine from outside the three-point line, shooting 52 percent. The Lady Devils, who jumped out to an 18-9 lead in the first quarter and a 34-32 lead at half time ran into depth issues in the second half. “We played seven and they went 12 deep and outsized us at every position, and late in the game our legs weren’t there,” King said. Despite the loss, King was impressed with what she saw out of her team. “We battled so hard, I was pleased with their fight,” King said of her team. The Lady Devils bounced back in the 2018 Triten Insurance Thanksgiving Tournament at Sullivan East on Friday, Nov. 23, with a solid win over Stateline Rush. The Lady Devils beat Rush 65-49. The Lady Devils led each quarter thanks to a strong output of offense from several players. Podvin had a breakout night, completing a double-double and finishing with 10 points, 11 rebounds and 6 assists. Leading the Lady Devils in scoring was Powers with 17 points. Also scoring double digits was Hendrickson with 10 points. Hendrickson also managed to get 4 rebounds and 4 assists in the victory. Vance scored 8 points, while Griffith had 7 points. Griffith also tied Holt with 8 rebounds each to lead the way for the Lady Devils. Like Griffith, Holt finished with 7 points. Street finished with 2 points. 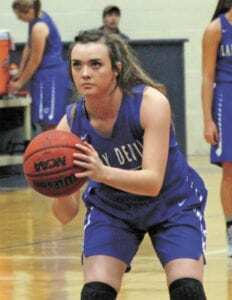 The Lady Devils continued to connect outside of the three-point line, going 10-22 against Stateline Rush for 45 percent. The Lady Devils also continued to be almost automatic from the free throw line, going 15-18 for 83 percent. On Saturday, Nov. 24, the Lady Devils wrapped up the 2018 Triten Insurance Thanksgiving Tournament at Sullivan East with a 58-38 victory over the Unaka Lady Rangers. The victory put the Lady Devils at 4-1 on the season, and 3-1 during the tournament. Hendrickson erupted by leading the team with 16 points and dishing out 8 of the team’s 16 total assists. Powers followed up with 13 points, while Podvin scored 11. The Lady Devils continued to find success from multiple shooters. Griffith and Vance each had 6 points, while junior guard Street had 4 points. Holt scored 2 points to round out the scoring for the Lady Devils. The Lady Devils continue to spread the ball around and play solid on both sides of the ball. “This team distributes the ball and really buys into setting each other up, I’m so proud of that,” King said. The Lady Devils will travel to Happy Valley on Friday, Nov. 30, to take on the Happy Valley Lady Warriors at 6:30 p.m. The Lady Devils will return home on Tuesday, Dec. 4, at 6:30 p.m. to face off with the Sullivan South Lady Rebels.